For other uses, see Seven seals (disambiguation). The seven seals contained secret information known only to God until the Lamb/Lion was found worthy to open the book/scroll and to look on the contents. Certain words and phrases used in Revelation had a clearer meaning to ancient readers familiar with objects of their time. For example, important documents were sent written on a papyrus scroll sealed with several wax seals. Wax seals were typically placed across the opening of a scroll, so that only the proper person in the presence of witnesses, could open the document. This type of "seal" is frequently used in a figurative sense, in the book of Revelation, and only the Lamb is worthy to break off these seals. From the Reformation to the middle of the 19th century, the seals in Revelation have been interpreted through various methods, such as the historicist view that most Protestants adopted and the views of preterism and futurism that post-Reformation Catholic circles promoted. Idealism was also a fairly major view that became realized since the time of Augustine, Bishop of Hippo (AD 345-430). The preterist usually views that John was given an accurate vision, of a course of events that would occur over the next several centuries, to fulfill the prophetic seals. Robert Witham, an 18th-century Catholic commentator, offers a preterist view for the period that spans the length of the opening of the seals; it being the period from Christ to the establishment of the Church under Constantine in 325. Johann Jakob Wettstein (18th century) places the date of the Apocalypse as written before A. D. 70. He assumed that the first part of the Book was in respect to Judea and the Jews; and that the second part, about the Roman Empire. The “Sealed Book” is the book of divorcement sent to the Jewish nation from God. Traditionally, the historicist view of the Seven Seals in The Apocalypse spanned the time period from John of Patmos to Early Christendom. Scholars such as Campegius Vitringa, Alexander Keith, and Christopher Wordsworth did not limit the timeframe to the 4th century. Some have even viewed the opening of the Seals right into the early modern period. However, Contemporary-historicists view all of Revelation as it relates to John’s own time (with the allowance of making some guesses as to the future). Moderate futurists typically interpret the opening of the seals as representing forces in history, however long they last, by which God carries out His redemptive and judicial purposes leading up to “the end”. The idealist view does not take the book of Revelation literally. The interpretation of Revelation’s symbolism and imagery is defined by the struggles between good and evil. Johann Jakob Wettstein (18th century) identified the first Horseman as Artabanus, king of the Parthians who slaughtered the Jews in Babylon. However, Ernest Renan, a 19th-century modern rationalist preterist, interpreted the First Horseman to be symbolic of the Roman Empire, with Nero as the Antichrist. This rider who "went forth conquering" was Rome's march toward Jerusalem in the year 67, to suppress The Great Jewish Revolt. In the historicist views of Nicholas de Lyra (14th century), Robert Fleming (17th century), Charles Daubuz (c. 1720), Thomas Scott (18th century), and Cuninghame, they agreed that the First Seal opened thereupon the death of Christ. Puritan Joseph Mede (1627) associated the opening of the First Seal to year 73, during the reign of Vespasian, just after The Great Jewish Revolt. Campegius Vitringa (c. 1700), Alexander Keith (1832), and Edward Bishop Elliott (1837) considered this period to have started with the death of Domitian and Nerva’s rise to power in the year 96. This began Rome’s Golden age where the spread of the Gospel and Christianity flourished. To 17th-century Dutch Protestant theologian, Vitringa, it lasted up until Decius (249). However, a more common historicist view is that the Golden age ended with Commodus making peace with the Germans in year 180. This rider represents the antichrist who will head the revived Roman Empire at the end of history, shortly after the Rapture of the church. This rider is a symbol of the progress of the gospel of the conquering Christ mentioned in Rev. 5:5; 19:11-16. Ernest Renan (19th century) interpreted the Second Horseman to be symbolic of The Great Jewish Revolt and the insurrection of Vindex. During The Great Revolt, civil war broke out amongst the Jews. The civil war not only dissipated their stand against Rome, but also divided the Jewish people into factions that eventually dis-unified Jerusalem. Hugo Grotius (17th century), interprets “the earth”, in verse 4, as the land of Judea. Johann Jakob Wettstein (18th century), identified the Red horse as representing the assassins and robbers of Judea in the days of Antonius Felix and Porcius Festus. Volkmar, a modern rationalist preterist, broadened the scope of the Second Horseman to include major battles that occurred after the year 66: the Jewish–Roman wars, Roman–Parthian Wars, and Byzantine–Arab Wars. The common historicist view of the Second Seal is associated with the Roman period fraught with civil war between 32 would-be emperors that came and went during that time. It was the beginning of the end for the Roman Empire. The Puritan Joseph Mede (1627) captured this timeframe from years 98 to 275. Christopher Wordsworth, in his Lectures on the Apocalypse (1849), declared a 240-year timespan, from years 64 to 304. During this period, Wordsworth indicated Ten persecutions: First, Nero; Second, Domitian; Third, Trajan; Fourth, Marcus Aurelius Antoninus; Fifth, Septimius Severus, Sixth, Maximinus; Seventh, Decius; Eighth, Valerian; Ninth, Aurelian; Tenth, Diocletian. The common historicist view of the Second Seal ends with Diocletian in 305. Other 19th-century views were that of Edward Bishop Elliott who suggested that the Second Seal opened during the military despotism under Commodus, in the year 185. While the Church of Scotland minister, Alexander Keith applied the Second Seal directly to the spread of Mohammedanism, starting in the year 622. The Antichrist will unleash World War III, and crush any who claim to be Christians after the Rapture. He allies with the Arab world in an effort to conquer the entire world. (Ezek. 38; Dan. 11) Only Jerusalem will stand in his way to world supremacy. Seal judgments two through four represent the disintegration of both human civilization and creation resulting from their rejection of the Lamb of God. The rider on the red horse represents the slaughter and war that the kingdoms of men perpetrate against each other because they reject the Christ. 6 And I heard a voice in the midst of the four beasts say, A measure of wheat for a denarius, and three measures of barley for a denarius; and [see] thou hurt not the oil and the wine. Hugo Grotius (17th century) and Johann Jakob Wettstein (18th century) viewed this rider as corresponding to the famine that occurred during the reign of Claudius, the Roman Emperor from years 41 to 54. Volkmar, a modern rationalist preterist, pinpoints the start of the famine at year 44, which kept repeating right into the First Jewish–Roman War of 66. Ernest Renan (19th century) viewed year 68 as the most significant year of the famine. The famine was so severe that “mothers ate their children to survive”, while Jewish revolt leader, John Gischala, and his men consumed the oil and wine that were luxury items from the Jerusalem temple. The common historicist view of the Third Seal is associated with the 3rd century. This was a period of financial oppression imposed on Roman citizenry, created by heavy taxation from the emperors. Taxes could be paid in grain, oil, and wine. Joseph Mede (1627) indicated that the Third Seal had opened from the rule of Septimius Severus (193) to Alexander Severus (235). The English clergyman, Edward Bishop Elliott (1837), also highlighted the significant period of taxation that was imposed under Caracalla’s edict in the year 212. Alexander Keith (1832) took the opening of the Third Seal directly to the Byzantine Papacy in year 606, following Pope Boniface III as an "Easterner on the papal throne" in 607. Inflation and famine will plague the earth during World War III. Though many will starve, the wealthy will enjoy the luxuries of oil and wine. This rider bespeaks the economic hardship and poverty that follow the unleashing of wars on humankind, while the rich get richer. This rider speaks the widespread death of Jews in their fight against Rome, which happens to be over a million Jewish deaths. Volkmar, a modern rationalist preterist, points to pestilence striking in year 66. This rider signifies twenty years of fighting, famine and disease that plagued the reigns of Emperors Decius, Gallus, Aemilianus, Valerian, and Galliennus (248-268). Spells death for one-fourth of the earth’s inhabitants. The war started by the Antichrist, will reach the finale with the seven bowls of judgments. This fourth rider symbolizes death that results from war and famine when men turn against men. This is the cry for vindication by the Christian martyrs who were persecuted by the Jews after Christ’s death and leading up to the fall of Jerusalem in the year 70. Both Ernest Renan and Volkmar, modern rationalist preterists, marked the year 64 as a significant year for Christian martyrdom. The name “Jerusalem” became synonymous with the persecution of the righteous. But God avenged the deaths of the righteous by allowing the Romans to conquer the “holy city” as retaliation for the Jews handing Jesus over to Pilate. This seal occurred during the rule of martyred Christians who were persecuted by Emperor Diocletian (284-303). This was the tenth period of the persecution of Christianity and the most severe, because of being on a “worldwide” scale. Then with Constantine’s rise to power, Christianity became legalized (313) and the church was thereby vindicated. This judgment encompasses Christians who will be martyred for their faith in Christ during the Great Tribulation by not bowing down to the Antichrist and by not submitting to the global economic system that forces all people on the earth to receive the mark of the beast. Their deaths place them in good company of the righteous throughout the ages. 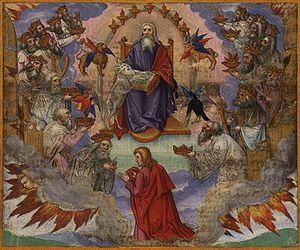 The fifth seal is a reminder that, though the Christ inaugurated the "Kingdom of God" through the preaching of the gospels, God’s people suffer during the tribulation that starts from the first coming of Christ to the second coming of Christ. This is known as the end-time tribulation that stretches across world history. Thus the “kingdom of God” is in history, but “not yet” triumphant. Hugo Grotius (17th century) viewed the sixth seal as it relates to the events during the Siege of Jerusalem by Titus in year 70. Volkmar, a modern rationalist preterist, marked the beginning of the sixth seal to year 68, with Galba assuming emperorship. 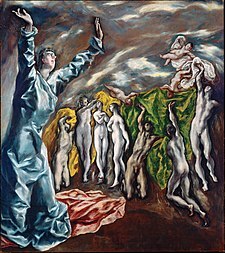 Preterists typically view the symbolic language as having been adapted from the Hebrew Bible, to allude to the environmental disturbances that fell upon Jerusalem before its fall. The mention of hiding in caves alludes to the many Jews who hid in the caves and underground when the Romans finally invaded. According to Jacques-Bénigne Bossuet (c. 1704), this was Divine vengeance that first fell upon the Jews for having the Messiah crucified, then subsequently upon the persecuting Roman Empire. First, however, vengeance was deferred until a number elect, from the Jewish people, was accomplished. Bossuet viewed the great Catastrophe of the Apocalypse as the conquest of Pagan Rome by Alaric I. Political upheaval and collapse of the Roman Empire brought about invasions of northern hordes of Goths and Vandals between 375 and 418. The sixth seal will be the literal cosmic disturbances caused by nuclear war or a global earthquake that causes volcanic debris to pollute the atmosphere, which turns the moon blood red and the sun dark. In addition, there will be massive meteor showers (“the stars… fell”). Thus follows the first half of the Tribulation where God’s wrath consumes the earth. Such wrath does not harm the Church because it was already 'raptured' before the Tribulation started, according to the pretribulation rapture theory. This is the end of the age when Christ returns, bringing cosmic upheaval on those who oppose God, the ones who persecuted His Church. The unrighteous are damned and the righteous enjoy the presence of God. The “silence” is the preparation for the judgment about to fall upon Jerusalem in the year 70. Johann Jakob Wettstein (18th century) went on to say that the “silence” conceded to the entreaties of King Agrippa I. This judgement was the divine response to the cry for vindication from the martyred Christians, such as: Stephen, James the brother of John, and James the brother of Jesus. The preparation of the altar is the preparation for the destruction of apostate Jerusalem as if it were a whole burnt offering. This is in accordance with how scriptures of the Hebrew Bible declare an apostate city should be destroyed. 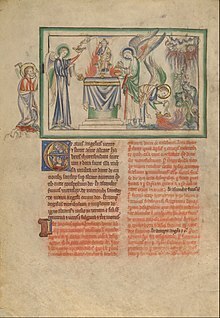 The priest would burn the city’s booty in the middle of the city square with fire from God’s altar. (Deut. 13:16, Judges 20:40) As Ernest Renan (19th century) noted about the “silence”, it indicates that the first act of the mystery has ended, and another is about to begin. The “silence” spans a 70-year period from Emperor Constantine’s defeat of Licinius (A.D. 324) to Alaric’s invasion of the Roman Empire (395). The prayers are those of the Christians martyred by Rome. 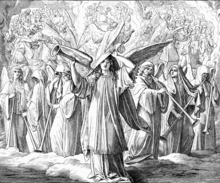 The seven trumpets represent the seven judgments that God had in store for the Roman Empire. The “silence” is the hush of expectancy for the verdict about to be pronounced on the guilty. The prayers are from the Christians who will be martyred by the 666 Antichrist in the Great Tribulation, the last three and a half years of the “end-time” tribulation. Both the trumpet and bowl judgments will be unleashed on the wicked during the second half of the tribulation, each judgment intensifying to the next. This silence quiets heaven so that it can focus on what is about to be revealed. It is the lull before the storm. The ensuing judgments vindicate Christian martyrs throughout the centuries. The trumpet judgments repeat themselves, again and again, throughout history, just as the seal judgments do, until the second coming of Christ. D.H. Lawrence wrote a poem called Seven Seals in 1916. The Book with Seven Seals (Das Buch mit sieben Siegeln) an oratorio by Austrian composer Franz Schmidt. The Seventh Seal, a 1957 film by Ingmar Bergman. The Seventh Sign, a 1988 film starring Demi Moore and Michael Biehn about a woman whose child is tied to the opening of the Seven Seals. The fourth season of Supernatural revolved around the breaking of seals as heralds of a coming war between angels and demons. The video game Darksiders presented the Seven Seals and the main character is the second seal War. The video game Darksiders II presented the Seven Seals and the main character is the fourth seal Death. The band Aphrodite's Child on their album 666 reference the seals in several songs. One is specifically entitled "The Seventh Seal". "The Seventh Seal" is the opening track of Van Halen's 1995 record Balance. Hip hop artist Rakim titled an album The Seventh Seal. Seven Seals is the name of a 2005 album by Primal Fear and also a track on that album. British experimental (apocalyptic folk) band Current 93 has several tracks that refer to the seven seals. Reggae artist Anthony B named an album Seven Seals and also references the Seven Seals in his song "Prophecy A Reveal". The Seven Seals were part of David Koresh's teachings to his followers among the Branch Davidians. Francis X. Gumerlock, The Seven Seals of the Apocalypse: Medieval Texts in Translation, Kalamazoo, MI: Medieval Institute Publications, 2009. The Seven Seals are included in the video game Far Cry 5 where the protagonist opens the seals to bring forth the apocalypse. "Seventh Seal" is the first track of the 2016 self-titled album by Flotsam and Jetsam. "Seven Seals" is the 4th track on Testament's 2016 album Brotherhood of the Snake. Wikimedia Commons has media related to Book with seven seals. ^ Unger, Merrill F, The New Unger's Bible Handbook, p. 301, revised 1998 edition by Gary N. Larson. Moody Press. ^ a b c Yancey, notes by Philip; Stafford, Tim (1996). The student Bible (New International Version. ed.). Grand Rapids, Mich.: Zondervan Pub. House. p. 1322. ISBN 978-0-310-92664-1. ^ Michael Counsell (August 2004). A basic Bible dictionary (null ed.). Norwich: Canterbury Press. pp. 107, Seal #3. ISBN 978-1-85311-475-5. ^ Thomas Nelson Publishers (1995-08-15). Ronald F. Youngblood; Frederick Fyvie Bruce; Roland Kenneth Harrison, eds. Nelson's new illustrated Bible dictionary (null ed.). Nashville: T. Nelson. pp. 1140–1141. ISBN 978-0-8407-2071-9. ^ a b Newport, Kenneth G. C. (2000-08-28). Apocalypse and millennium : studies in biblical eisegesis (1. publ. ed.). Cambridge [u.a. ]: Cambridge Univ. Press. p. 15. ISBN 978-0-521-77334-8. ^ a b Newport, Kenneth G. C. (2000-08-28). Apocalypse and millennium: studies in biblical eisegesis. Cambridge University Press. p. 16. ISBN 978-0-521-77334-8. ^ Newport, Kenneth G. C. (2000-08-28). Apocalypse and millennium: studies in biblical eisegesis. Cambridge University Press. p. 86. ISBN 978-0-521-77334-8. ^ a b c d e f g h i j k Cook, Frederick Charles (1881). Frederick Charles Cook, ed. The holy Bible, authorized version, (comm. and a revision of the tr. by bishops and other clergy of the Anglican Church ed.). Oxford University. p. 583. ^ a b c d e f g h i Cook, Frederick Charles (1881). page 584. p. 584. ^ Eijnatten, Joris van (2003). Liberty and concord in the United Provinces: religious toleration and the public in the eighteenth-century Netherlands (null ed.). Leiden: Brill. pp. 84–5. ISBN 978-90-04-12843-9. ^ a b Cook, Frederick Charles (1881). See Joseph Tyso’s table from "An Exposition of the Books of Daniel and the Revelation". p. 583. ^ Geoffrey W. Bromiley, ed. (June 1995). Q - Z. (Fully rev., [Nachdr.] ed.). Grand Rapids, Mich.: Eerdmans. p. 174. ISBN 978-0-8028-3784-4. ^ a b c d e f g h i j k l m n o p q r s t u v w x y z aa ab ac ad Pate, C. Marvin (2009-05-31). 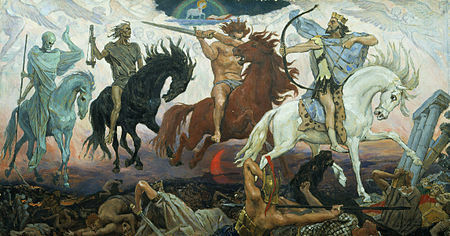 Reading Revelation : a comparison of four interpretive translations of the Apocalypse (null ed.). Grand Rapids, Mich.: Kregel Academic & Professional. pp. 19–32. ISBN 978-0-8254-3367-2. ^ Cook, Frederick Charles (1881). pages 582-3. ^ a b c d Cook, Frederick Charles (1881). page 582. ^ Ekonomou, Andrew J. (2008-12-28). Byzantine Rome and the Greek popes : Eastern influences on Rome and the papacy from Gregory the Great to Zacharias, A.D. 590-752 (1st paperback ed.). Lanham, MD: Lexington Books. pp. 48–49. ISBN 978-0-7391-1978-5.